For those who didn’t hear, I switched to the 25 km race and wanted to share my experience last Saturday! School was a lot more busy than I had expected. I didn’t even run once in nearly a month leading up to the race. 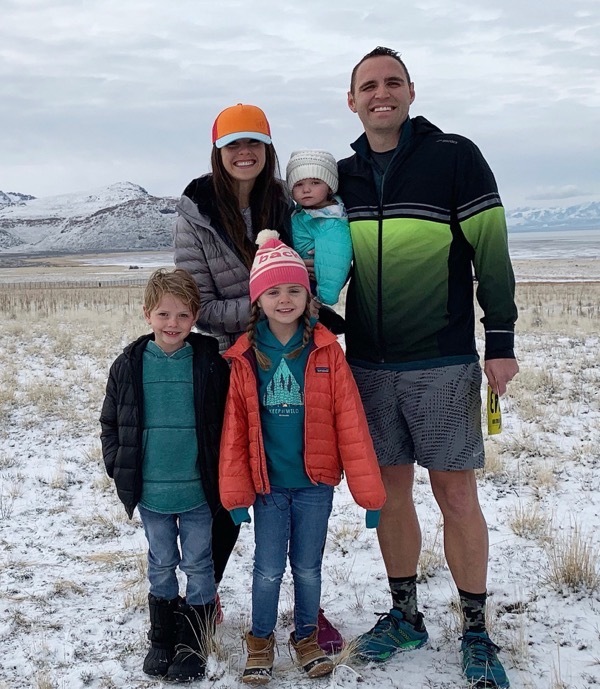 A few people asked why I was still doing a race, during the end of the semester, finishing clinicals etc, but I just felt like it was really something I wanted to do. It was like a last hoorah and some kind of “reward” or experience to mark the ending of nursing school. If you don’t get it, its okay, I don’t know how to explain it, haha. So the night before the race we went to Wasatch Running Center to go pick up my bag and a few last minute essentials. It took us A LONG time to get up there. It was snowing pretty hard and there were a few accidents that really slowed things down. Janae and I thought it would be fun to choose a new pair of socks to sport for our races, this might be a new tradition!! We stayed at my parents’ home in Layton, which was only 30 minutes away from the start of the race. My dad cooked up his famous spaghetti and meat sauce with garlic bread. We went to bed around 9:30. We didn’t have to get up until 6:45am because the race start was at 9am. The plan was to wake up at 6:45, get everyone ready and leave at 7:30 to be an hour early for the race to start. When we got up it looked like it had snowed a little bit through the night. I was really worried that I was going to be running in several inches of snow and ice. For breakfast I had a muscle milk shake, banana and some toast with an exuberant amount of peanut butter and honey. 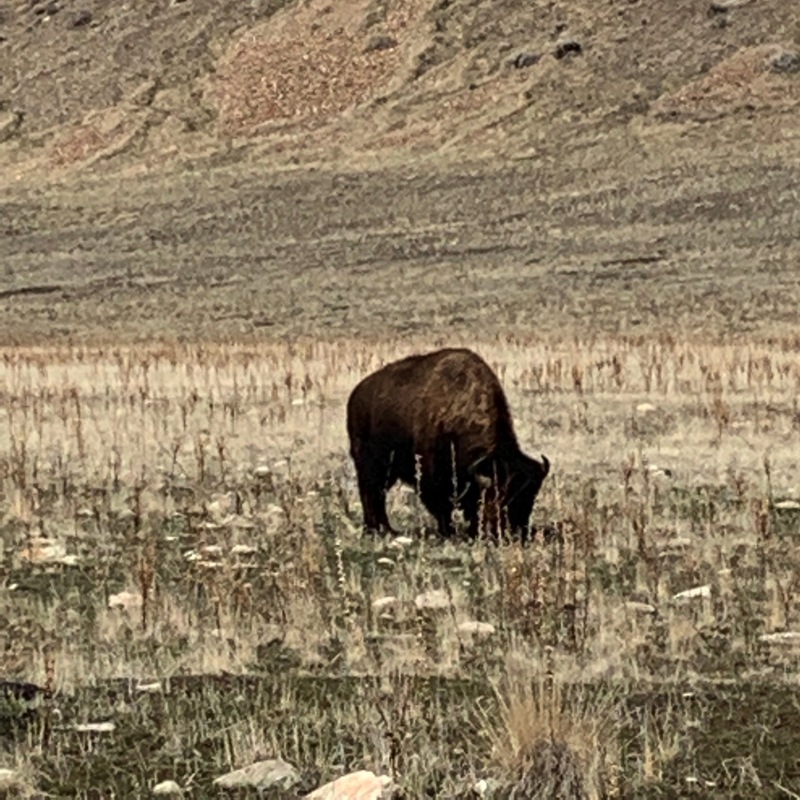 On our way to the race we saw some huge buffalo and the kids thought I was crazy to be running near buffalo that big. 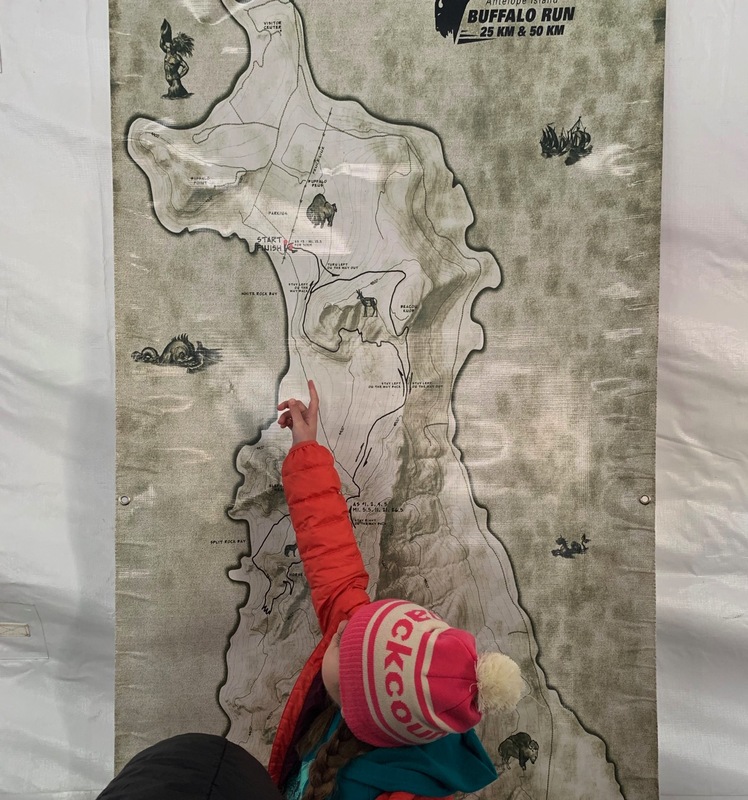 For this race they had two check-ins, one before the island (either the day before at Wasatch Running Center or early morning at the state park entrance). I got my bib and we took a few pictures and we got in the car to warm up. 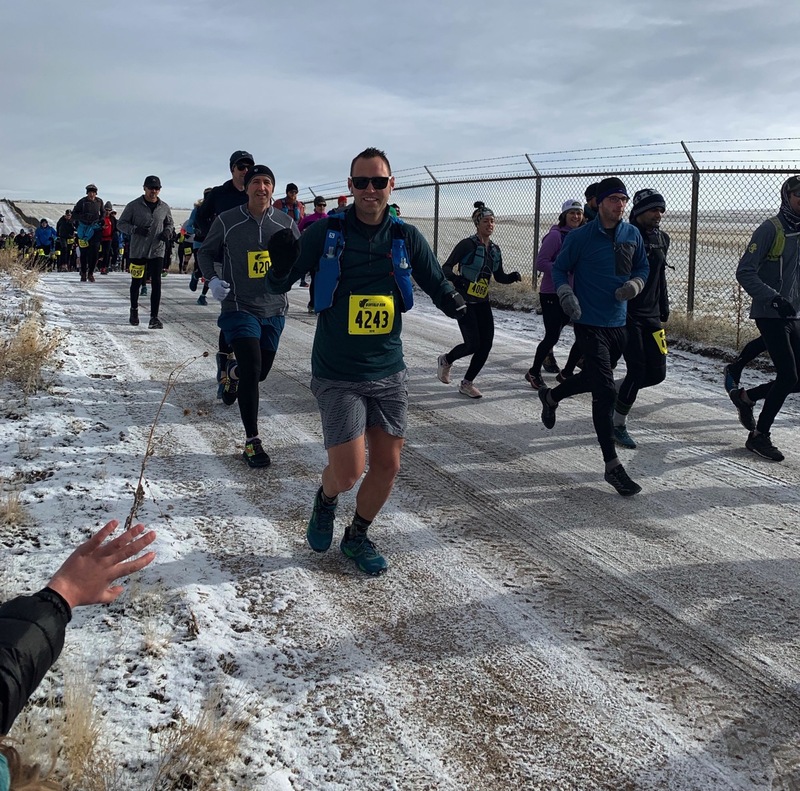 The temperature was around 30 at race start and there wasn’t much snow, which I was stoked about. I asked Janae if I should take my running vest with me or if I should go light and with minimal stuff. She told me that I should take it and I didn’t know what I wanted to do. I saw both types of people, but I decided I should listen to the advice of Janae, she has been running WAY longer than I have. The race had two aid stations one at about 5.5 miles in and the other at 10.5. Spoiler alert, I am SOOO glad I had that vest. The race director had a quick 5 minute meeting right before the race and we all lined up. I popped my AirPods in and got ready and took off. Usually I will wait a few miles to put in my music so I can listen to my body and not get too hyped the first few miles. I don’t know why I didn’t do it this time. I really paid for this, the last few miles of the race. By the end of the first mile, there was a long gradual hill. 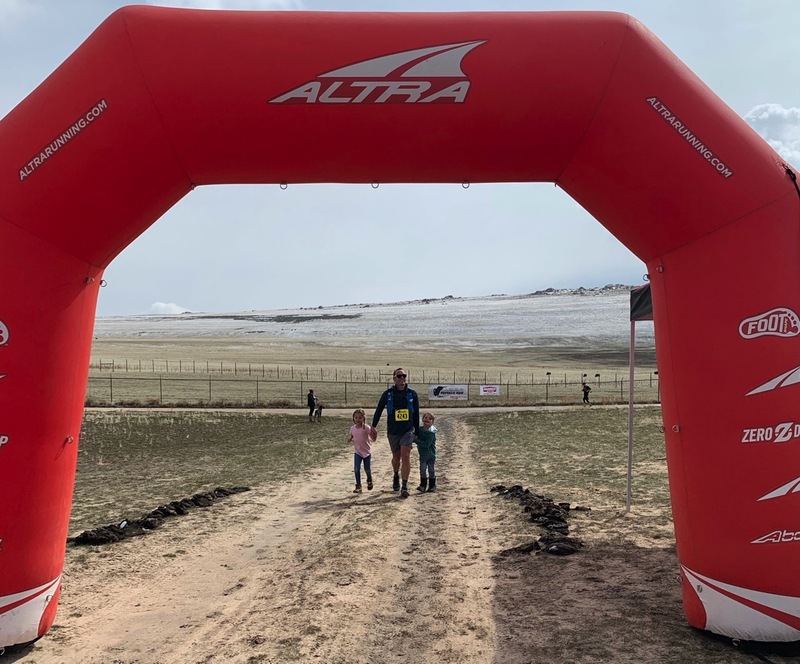 I didn’t go into this race with any real goals or tactics, but I heard it is important to take it easy on the hills, walk if needed, and run the flat and downhill. This helped me conserve some energy and get some needed breaks throughout the course. There were some pretty gnarly hills, some that I remember most were at mile 5ish, and 9-10ish, I could be wrong. I had to pull out my phone a couple times to snap a few pictures. IT WAS GORGEOUS. I really was nervous for this race, but I thought I would make Janae nervous too and I wanted to show her what I was seeing. So I Facetimed her real quick to show her the views. Spectating this race is near impossible, unless you want to run a few miles in and back. When she answered I could tell that she was was like, “OH NO, what is wrong? ?” hahah, it was a little mean but it was funny and I showed her the views that I was seeing. These guys were sprinkled all throughout the island and man they are HUGE. We didn’t get too close to them, but the race director says sometimes there are runners that get too close and it can be scary. So let’s talk fuel quickly. I had my two bottles of water in my vest, 3 gus and a nanohydrate. I was about 50 minutes in when I took my first gu and shortly thereafter I got to the aid station, I didn’t time that well. I just got a quick drink and walked for a second and got on my way. I didn’t really look what they had in regards to nutrition, but I saw bananas and tons of gus and drinks. Another 40ish minutes in I took a gu and my nanohydrate and I feel like that was around mile 8-9, if my memory serves me well. This was at the top of a HUGE hill. At this time my legs were pretty spent. I ran everything that was flat and downhill and I would walk/jog on the uphills. I was trying to calculate how much distance I had left and miscalculated thinking I only had 5ish miles to go, but I had more like 7ish. I got to the aid station, the same one that I passed earlier because I made a loop, and they had everything you needed. I saw chips, soda, rehydration drinks, peanut m&m’s and much more. I guess I didn’t look good because one of ladies there said hey you look like you need some more salt right now. I downed another gu, chips and some m&ms and got moving again. I knew if I started to take a longer break it would be harder to keep going. I think I should have spent more time there, but who knows what was best. This was when I realized that my calculations were off and I had some more mileage to put down to finish the race. I didn’t drink enough and I could feel it, my legs were always inching towards a full on cramp, but I downed what I had left of water and kept on going. The last two miles of the race seemed more like the beginning 10, BUT I was so stoked to see my family at the end. When they saw me the kids came running toward me. It was awesome to run with them through the finish holding their hands and to see Janae and Skye. I was thinking of trying to get under 3 hours but when I was running I decided that I need to focus on MY wins and not what I did not do. I am so happy to be able to do this. I think this is my first trail race. This was a new experience altogether for me. The race “medal” was a mug, as seen below. This is awesome, I like it much better than a standard medal!!! The cool thing was that they had soup that was pipping hot ready for us and we used our mugs for it. It was such a brilliant idea and I needed that salt so bad so I chugged that down so fast. We didn’t stick around too long, but everyone there was so supportive and nice. This race was so well organized. To be honest, mind you this is 2 days after I ran, I would like to do this race again. I would do the 25K, nothing more, but I would like to try it again. – I am SO GLAD I did this. I know my running relationship can be love/hate at times, but this definitely put me out of my comfort zone. It would have been easy to say, I have too much going on and its okay to quit, but I’m happy I stuck with it for the most part. A 50 miler would have killed me off. I’m glad the race director let me switch to the 25 km. 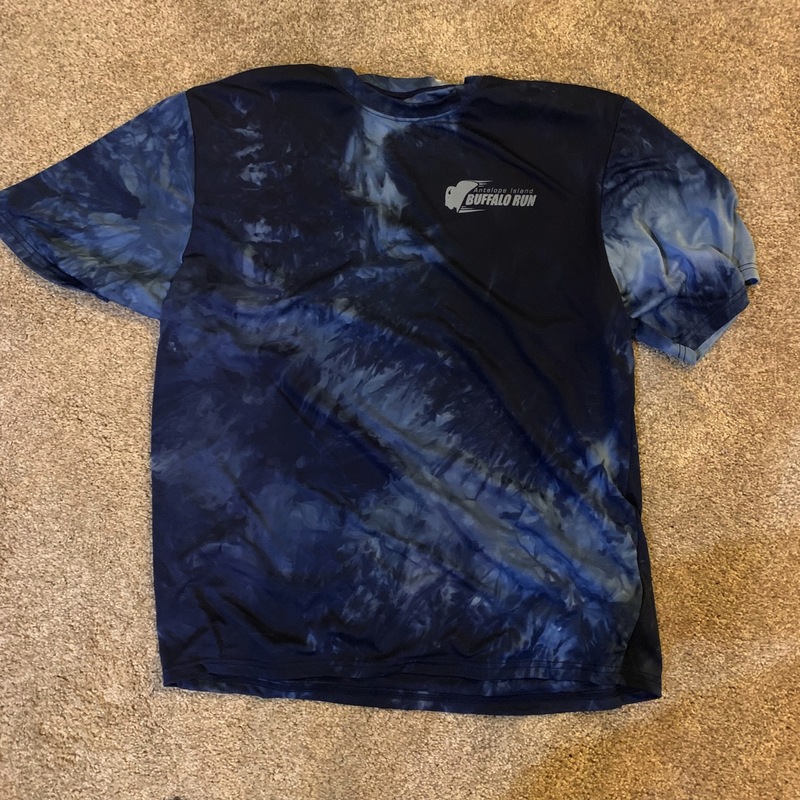 -Training during the winter is tough and I spent quite a bit of time on the treadmill because it was easier, climate-controlled and I could watch movies, etc. I was totally under prepared for the elevation gain/loss. If I do this again next year I am going to make sure to get in LOTS more elevation gain. – Foot placement is also important. I literally almost ate dirt so many times. One of the runners in front of me stubbed a toe and went face first into mud. They were caked with it the rest of the day. You can’t just go into autopilot, you have to be alert. – This might not be the case for everyone but road performance does not equal trail performance. They are different races altogether and my expectations of paces and what I thought I would finish at were vastly different. Don’t get me wrong I wasn’t running for a time, I was estimating what it would take, that’s all. – Like I said earlier I was SOO glad I had my running vest on. I didn’t know how much more fuel I would need during the race. – I like how some races are trying new ways to cut down on waste and be more efficient. 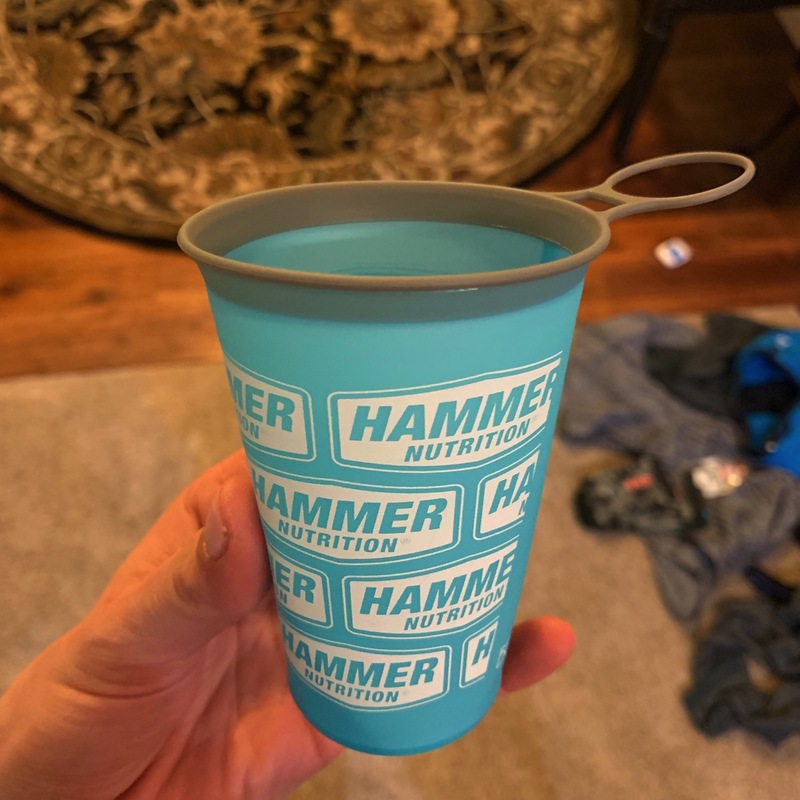 Hammer nutrition gave each runner one of these cups to make it a cupless race. 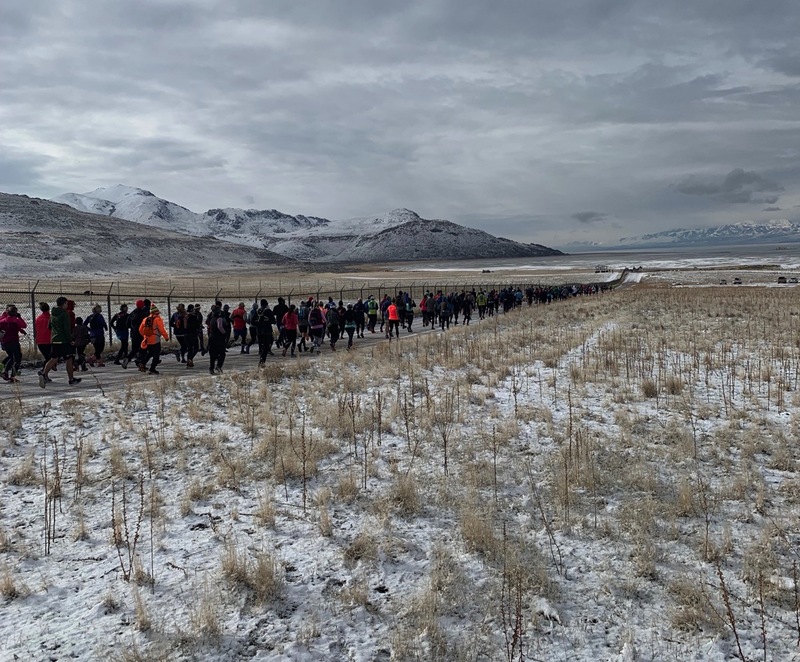 It was perfect for the amount of people running and how spread out we were. – There definitely is a different feel to a trail race. I really don’t know how to explain it, but the best way I can is it is more laid back and casual. I could be wrong, but that was my observation. To sum up it all up in one sentence: This race pushed me to my limits, I love what I learned about myself and this just might not be the last trail race I do. — I know Janae is going to laugh when she reads this, I told her right after that I wouldn’t do it again… time will tell! Did anyone out there run the 25 km? Are any of you doing the 50 Km, 50 miler or 100 miler??? What was your first trail race? How far was it? What do you prefer? Road or trails? Best food for races to put at the end of a race? Who has finished up schooling recently? What are my work plans? Congratulations, Andrew! The best post-race snack and awards I’ve had are apple pie. 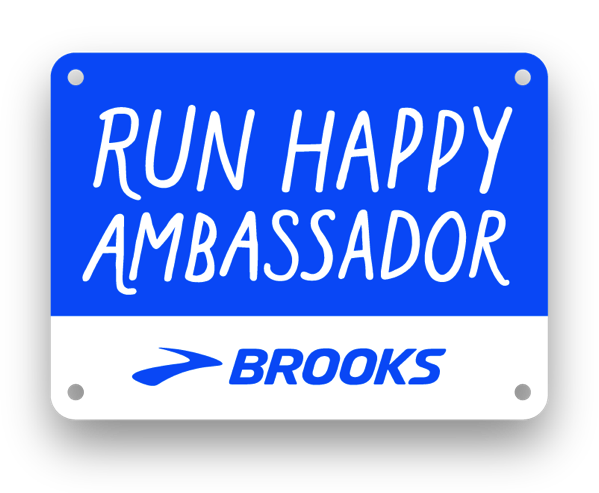 I hope you can relax and recharge for some beautiful spring running. Hi Andrew! I’m finishing up my masters while working full time and have a half marathon the week I finish my degree! It’s been crazy because I am working hard for that sub 2 time and finishing my research paper! Feeling a little burn out today so it was nice to see your post. It will give me the motivation to do my run today. Good luck with finishing school and congrats on the race!!! Maddie, you are on fire! WOW… you have so much going on! Good luck with it all and huge congrats on finishing up your degree and all of the training you have been doing! Congrats on your race, Andrew! What a sweet finish you got with Brooke and Knox running in with you and holding your hands. So precious and a memorable moment for sure!! I typically prefer road running, but I want to start trail running more. I’ve done some canyon runs in Orange County while I’ve been out here, but there are some trails I want to start running when I’m back in Texas. I don’t know that I’ll ever do a trail race, but I did have a dream last night that I ran one. Ha! 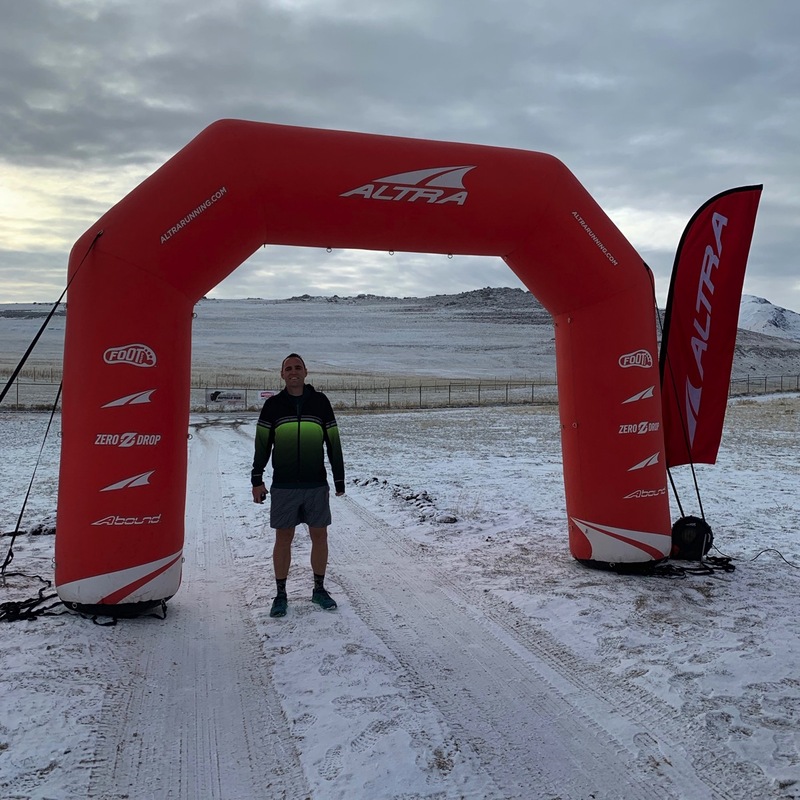 I ran my first trail race, a 50K, in November- it will probably be my last at that distance, but never say never ;) I REALLY enjoyed it, and completely agree with you in that trail races are much more laid back. The atmosphere is almost family-like, at least it is with the 50K I did. Once you sign up and start training, it’s like you have a whole new set of (crazy) friends! It was difficult, but like you said, I think it was worth it! 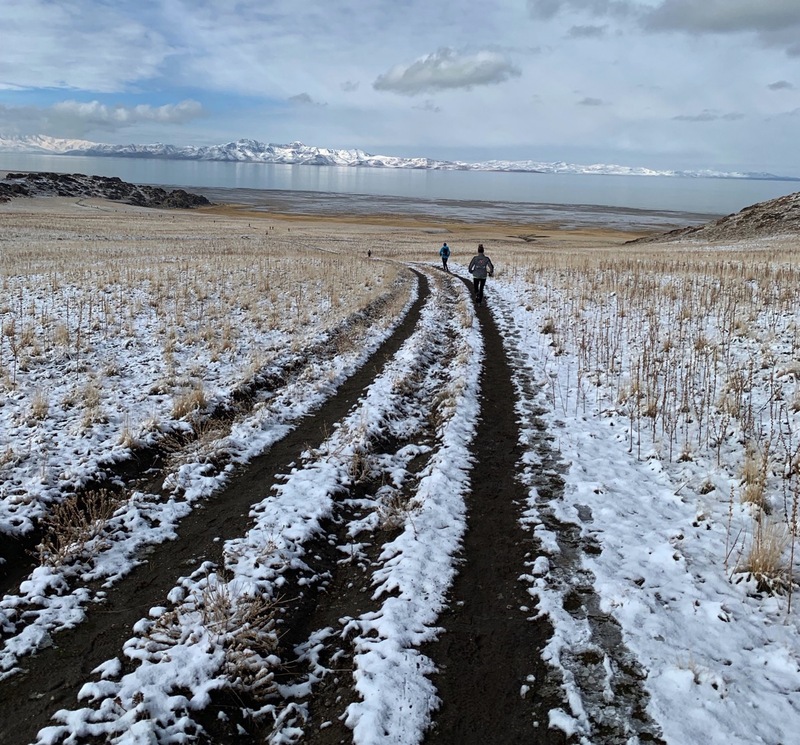 I actually prefer trails, I like not having to worry about traffic and I feel like pounding pavement only intensifies the pain in my legs after. For fueling my trail races, I usually stick to an old fashioned pb & j sandwich! 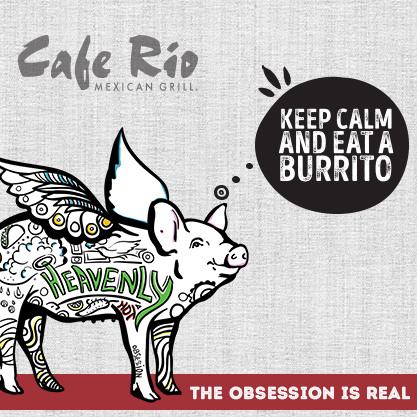 It never bothered my stomach and seemed to ward off extreme hunger. Congrats on almost finishing school! I’m currently in an Ed. S. program and will graduate in May! One more class- I can see the light!! Congratulations Andrew! A friend and I are signing up for some of the Park City Trail Series and this makes me excited. Beautiful pictures. Oh fun!! You’ll have to let us know which ones are your favorites, I’d love to go do some there! Have a wonderful day Angie! WHOOHOO! Congrats, Andrew! I prefer road races- I live in MN so we don’t have many trails, therefore I have never done one!! Best food at the end of the race- cookies. I just want a giant cookie, I don’t care if it is 9 am. Ohh and a warm caramel roll.. Okay so anything sweet!!! I really enjoyed reading this! I’m training for my first 50k, and signed up for a trail 25k as a training run. Thanks for the insight on nutrition because I always fail in that department. Big time. Trail running is where it’s at! I’ve done a handful of trail races (my furthest was my first half marathon), and there’s a unique camaradarie about it all. It’s all about helping each other get to the finish line, and less competitive (at least for me ). Good Job Andrew!! How exciting that you are so close to being done with school! 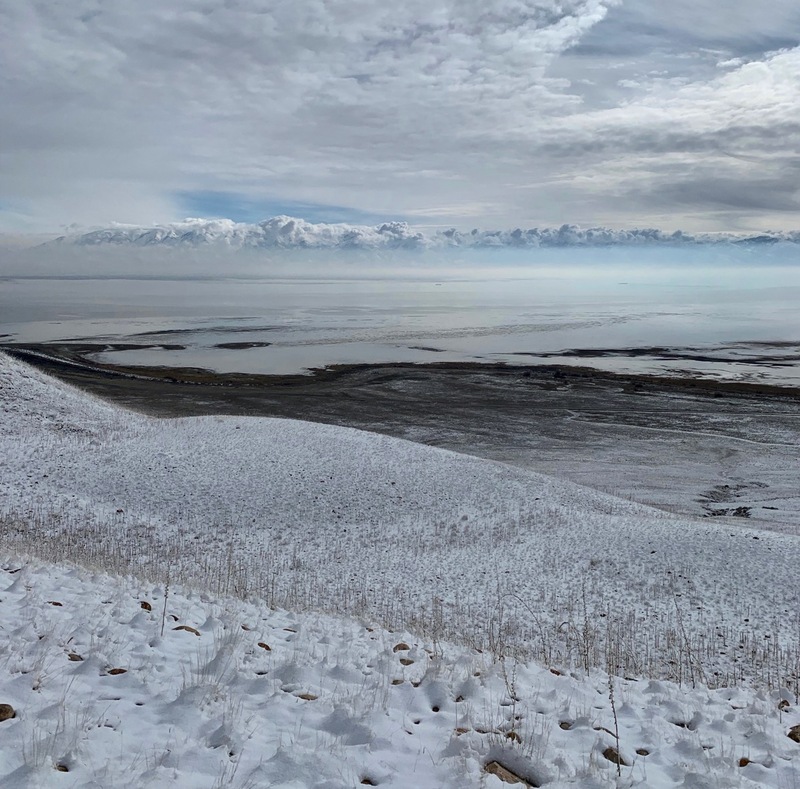 Antelope Island is gorgeous…I’ve had many friends take engagements and family pictures out there! Congratulations Andrew! That mug and those muddy legs are the best. Enjoy your recovery! Alison, I am SO so so excited for you! You are going to do amazing… please keep me updated with your training and how the race goes. Have a wonderful day! Congratulations Andrew! I can’t imagine doing a race after not running for a month but you persevered despite all obstacles. 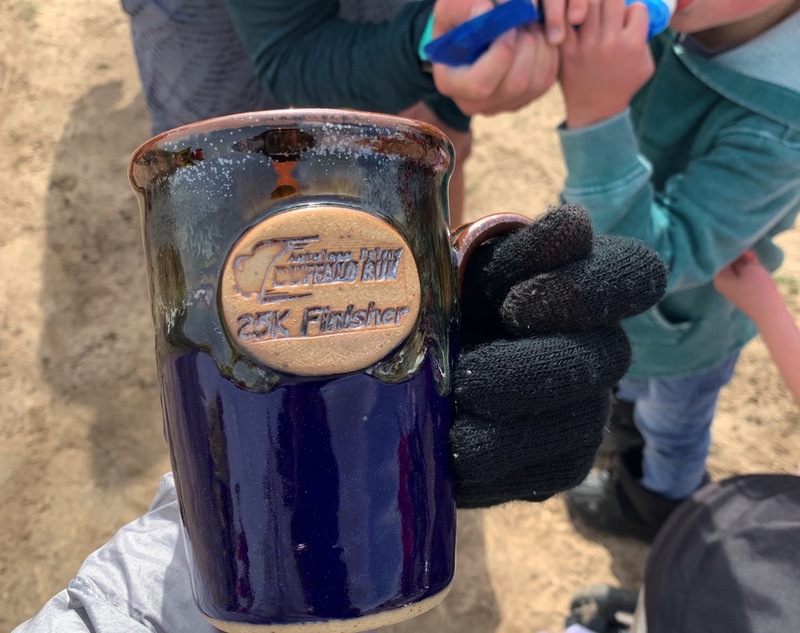 I love the mug idea vs a medal and I love that they served hot soup afterwards. The views were absolutely beautiful! Congratulations also on finishing nursing school! Congratulations! I love trail running. My first trail race was a fall 25K. It was so muddy that I think everything else is easy. Last year I ran my first Ultra, a trail 50K, then I ran a 6 hour endurance race and an 8 hour endurance race. I will run my first 50 miler next month, so I am just about to taper. So much fun and the trail community in Minnesota is the best! Congratulations Andrew!!! You did amazing!!! I used to love trail running when I lived in NH and there were fall leaves and pretty mountains etc but now I live in Florida where it’s flat and there are alligators and venomous snakes so I’m more sidewalks. I feel like buffalo would be cool but I don’t know enough about them. Moose and deer just avoided me. It’s funny because in 2018, I actually ran 3 25ks. Such an interesting distance. It looks beautiful. When I ran a trail race in Colorado, I had to stop and take some photos because it was so beautiful. I always appreciate when races give different finishing prizes instead of the standard medal. Congrats Andrew!! I think the best part is that you finished and now you have learned some things for next time. It’s fun to try something new. 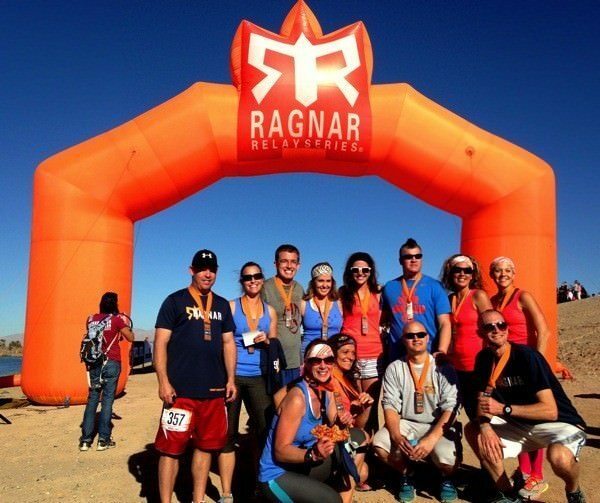 I did my first obstacle 5K last year and it was so much fun, I immediately signed up for the one this year. I’m currently training for my second powerlifting meet which is less than a month away and also in the middle of my MBA, working full time and getting married in May. Definitely a full plate for me. Thanks for the inspiration and enjoy relaxing now. WOW… that is insane. I can’t even begin to imagine running that long!!! Thanks for commenting!!! Congratulations Andrew! What an accomplishment. Congratulations Andrew! 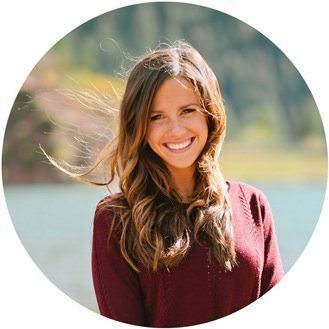 I am amazed with how much you’ve been able to accomplish over the last several months! A move, finishing school and now this! AMAZING! Questions about the drinking cup…was it disposable? Where did you store it? I’m SO interested in saving the environment! I love this idea! Thank you!!! The cup was like a silicon/foldable cup and it was durable, I think you could reuse it for quite a bit of time! It was such a good idea. I’m going to be doing a new race this weekend. It’s a 50K but I’m doing the relay race. It will be about 6 miles for each leg and it will be part trail, part grass, part road. Luckily I am very familiar with where we are running! Hearing you say a trail race is fun made me so excited to for Saturday! Great job, Andrew! Way to gut it out with the decreased running toward the end of school. Congratulations! I’m so proud of you, Andrew! You took it easy, ran your own race, and finished with a smile on your face. What more could you ask? I find that trail running is SOOOO different than road running. One year, I ran a road marathon in 3:30(ish), and a trail 50k in 6(ish) hours. Both felt like the same effort. Actually, that 50k was my first trail race! Way to go Andrew! Awesome job on your first trail race. You should be very proud! You really have to pay attention to your nutrition and hydration in the days leading up to the race. Once you notice it on the trail, it might be too late to get in under control. Chicken soup is a great for the night before…you get a little salt in before you need it. Best post race food is PANCAKES!! In the summer I love it when there is watermelon and orange slices after a race. Congratulations on finishing school! I have some friends in nursing school and they say it is tough but very rewarding. Can’t wait to see what you do next! I did that race a few years ago and loved it!! Trail running is a different animal all together and the people are great! Times are definitely different. My brother is an insanely talented runner. He can do a marathon in 2 1/2 hours without much training. Last Saturday he won a 100 mile race in just over 20 hours! That’s about 11 – 12 min miles. I’m so proud and pretty jealous. Haha he doesn’t do much but work and run/train. I don’t have that kind of dedication. Plus I’m a nurse! Being up all night is hard. (Said in a fake whiny voice). Great job Andrew. Should have taken some bacon. YOUR BROTHER IS AMAZING (and so are you)! Huge congrats to him… I can’t even imagine doing what he did. Good call on the bacon… I’ll have to have some at my race. Let us know next time you are back to this race and we will join you. Have a beautiful day! You’re post makes me hungry for another 25K trail race! and the description of your experience is spot on. Trail running is just…different. It hurts different than road races and I would say that the exhilaration of finishing is different. Also-I love trail runners they’re(we’re??) the laid back hippies of running-haha! I was the one who fell at my race so my advice to others is to be mentally prepared to trip and fall-you’ll be okay and the other runners will kindly make sure you’re good to go. Congrats on finishing, Andrew! As far as needing salt, I highly recommend Hammer Nutrition’s Endurolytes – they are more than just salt. My cycling husband uses them on races in Hawaii, too. I have never done a trail race. I haven’t been on the trails in almost a year. I severely sprained my ankle last April and I’m still a little afraid of getting on the trail. I always want something salty after a race – pretzels are about all my stomach can handle for the first 30 minutes or so. Once my body starts calming down, everything is free game! Congrats!!! 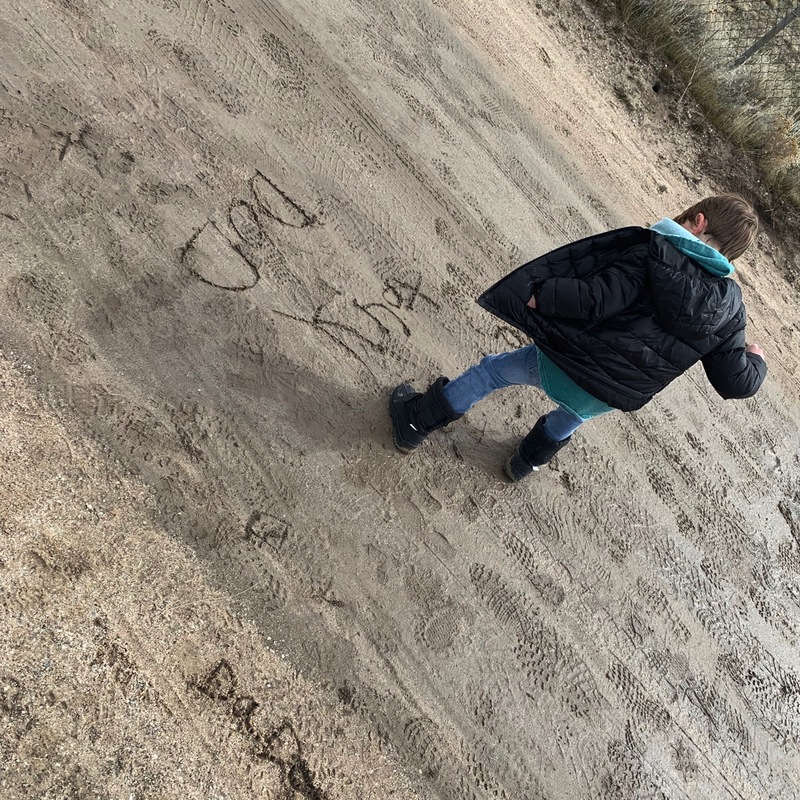 I know how hard it can be to try and balance work/school/family, plus find time to run! You should be proud of yourself! Congratulations on your finish! Small world, but my uncle makes the finisher mugs! NO WAY!!!! That is so so cool!!! Huge congrates Andrew, well done!!! Really! Oh that is awesome Gabi about the marathon and the 25k! I hope you get to get back to the trails soon. Have a great day Gabi. thanks!!! all the best to you! Congratulations Andrew! This is really huge and I am amazed and impressed you did it in addition to finishing such a demanding program right at the same time. 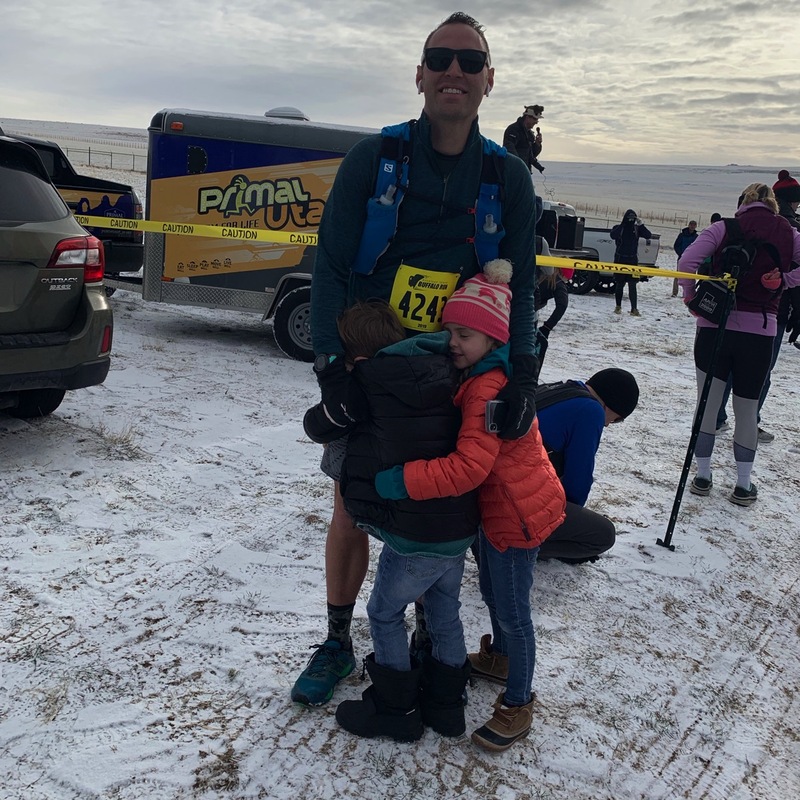 My husband just finished his MBA (part-time night program/ full-time day career) and all of that with family, home, and church, throwing in a grueling race like this definitely would’ve snapped both of us during that process. So definitely kudos to you for being able to tackle it. Plus I was reading on the website from the director how the course (for all of the racesin this series) are ALWAYS long and most people don’t realize it and he’s not responsible, he can’t cut the course on a state preserve park. :) So yeah, you expected a 25k, but dude, you didn’t do the math wrong, the course is long…way long! Anyway, great job! You mentioned a more laid back vibe. I’ve never done trail running but some of the things you described reminded me of two documentaries. First, “The Barkley Marathons: The Race That Eats Its Young.” That one is equal parts what-the-what?! and funny. But the second I thought of is “Made to Be Broken.” That’s about a guy who is running to break the record for “hiking” (running) the Appalacian Trail and while he has to be very focused and intense and in his head and watching every step the whole way, his team has to he completely chill, happy vibes, making camp all about keeping him in a good head space and filling him full of as many calories as possible as fast as they can, all while acting like they’ve got nothing better to do with life, in order to keep him from freaking out. Anyway, your race description made me think of that vibe…pretty good watch. Great job on the race, huge congrats! Way to go Andrew!!! It looks like a really neat course! Trail events really have killer hills-what’s up with that?! I prefer trails to roads-BUT I do NOT like rocks/roots/ruts (tripping). I just love that pace is not the priority. It’s so lovely to run and scamper amongst the trees and wildlife! When I go to the states to visit home, my brother and I do adventure runs together. Last summer we did a 36miler on the PCT. Leading up to it we did some really crazy routes around Oregon to practice running at elevation and vert. Best post race/long run “fuel” for me is a hot coffee, ice cream, and chips. Followed by something yummy/crunchy/fresh and NOT a fruit or nut!!! Again, good job this weekend AND conquering nursing school!! AT THE SAME TIME!!! You did AMAZING! 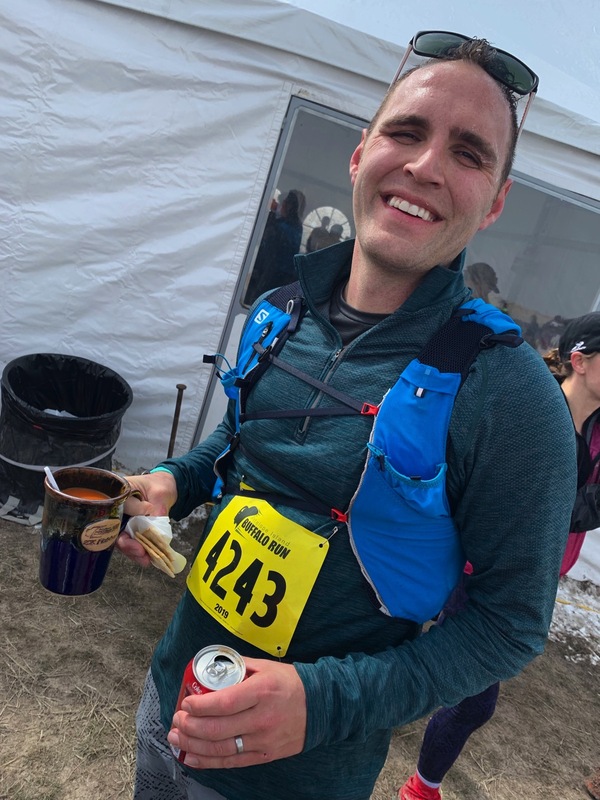 Soup at the end of trail races seems to be a thing. I did a 3 miler back in January that had a soup buffet at the end too. Every year we do a trail turkey trot with my nephews for Thanksgiving. Its only a 5k. Someday I would love to try a 30 or 50 miler. I prefer the trails. Time seems to go faster on the trails since you are focused on your footing and the scenery is a pretty good distraction. But where I live its hard to get on the trails so I mainly stick to the roads. 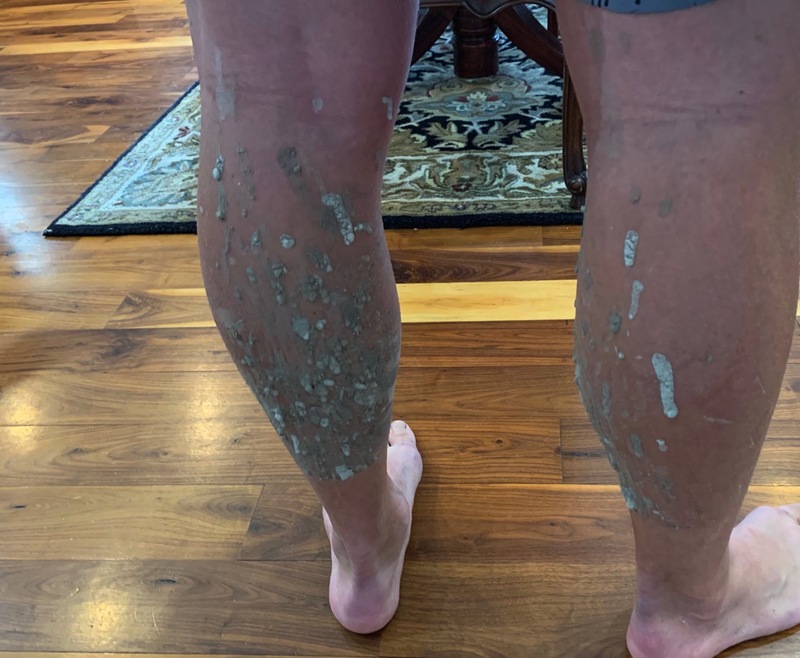 I haven’t done a trail race….think I may be a bit clumsy for trails, ha! In the summer my favorite half marathon had fresh local peaches at the finish line, and I love the idea of French toast at the finish…..but I’ve never run a race that had that…..yet. Incredible!!!! 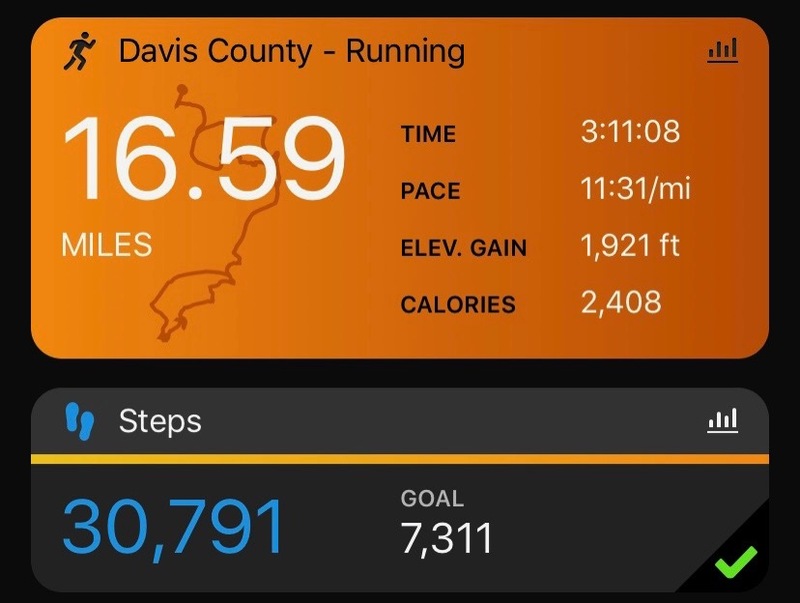 My running took a complete nose dive in my last year of nursing school – for whatever running was not helping with my stress (which is when I know things are bad), but that’s nursing school for ya! This is a really incredible accomplishment. Hats off!! !